The Lakers started the 2017-18 regular season with a split against Upper Peninsula rival Northern Michigan. Played as a non-conference home-and-home series, the Lakers beat the Wildcats 5-3 on Friday night in Sault Ste. Marie, before falling 4-1 in Marquette on Saturday. Power play was the name of the game on Friday night, as the Lakers and Wildcats both scored the majority of their goals with the man advantage. LSSU went 4 for 6, while NMU was 2 for 6. Starting things off for the Lakers was Diego Cuglietta on the power play. Cuglietta’s goal, which came during a goal mouth scramble, put the Lakers up 1-0 6:27 into the game. Less than two minutes later, Lake Superior made it 2-0 when Max Humitz redirected a shot from freshman Lukas Kaelble past Wildcat netminder Atte Tolvanen. The Wildcats got one back late in the period when co-captain Robbie Payne scored a power play goal on goaltender Nick Kossoff, sending the teams to the dressing room with the score 2-1 in favour of the Lakers. Getting the Lakers back on track in the second period was J.T. Henke. Henke, the lone senior forward this season, put the puck over the right shoulder of Tolvanan, knocking the water bottle off of the net in the process. NMU struck back less than a minute later, when Caleb Schroer scored on Kossoff to cut NMU’s deficit to one. A scrum in front of the Lakers bench with two minutes left in the second period led to a five minute major and game misconduct for the Lakers’ Humitz. A coinciding minor to the Wildcats’ Philip Beaulieu meant the Lakers would start the third period on a three minute penalty kill. Starting off the third period on the right note, Lake Superior killed off the remainder of the major penalty (being served by Bryan Basilico). Then, less than 15 seconds after the expiration of the penalty, Cuglietta got in on Tolvanen and scored his second goal of the night, making the score 4-2 Lakers. Lake State managed one more goal in the game, their fourth power play goal of the night. After trying a few times to beat Tolvanen, Anthony Nellis slipped the puck between the goaltender and the post on the short side for a 5-2 lead. Tolvanen was then pulled and replaced with Mathias Israelsson. Although the Wildcats got a goal back (Robbie Payne’s second of the night), it was too little too late, as the Lakers went on to win 5-3. Nick Kossoff made 33 of 36 saves to collect the win. Tolvanen stopped 21 of 26 in the loss. While the power plays of both teams were on display Friday night, neither team could score with the man advantage on Saturday, as the Wildcats took a 4-1 win over the Lakers, splitting the weekend series. Northern Michigan got on the board first with another goal from Robbie Payne. Payne managed to get Kossoff out of the net and put the puck in to take a 1-0 lead. During the second period, the ‘Cats ramped up their intensity, outshooting the Lakers 11-7. Although Philip Beaulieu scored a goal with under a minute in the period to make it 2-0 Wildcats, Kossoff was strong in net, making many big saves for the Lakers. Lake State got on the board 4:15 into the third period when Jake Hand buried the puck under the crossbar. Hand received a pass from Diego Cuglietta, who had picked off a pass between two NMU defenders. With the score 2-1 Wildcats, the Lakers showed their intensity, putting many shots up on Tolvanen. The Wildcat goaltender showed why he was nominated to the Mike Richter Award watch list, however, and stymied the Lakers at every turn. With a little over two minutes to play, NMU’s Denver Pierce (a Sault Ste. Marie native) brought the puck into the Lakers zone. Pierce got around defenseman Matt McArdle and put a shot on net that managed to get by Kossoff, making the score 3-1 ‘Cats with 1:59 remaining. An empty netter from Payne wound up making the final score 4-1 Wildcats. With the win, the Father Cappo Cup series is now tied at one win apiece. Should the season series be tied, the winner of the Cup will be determined by goal differential. Currently, the Wildcats hold a 7-6 lead in goals. The Lakers are back home this week against their other Upper Peninsula rivals, the Michigan Tech Huskies. Game time Friday is 7:37 p.m. and 7:07 p.m. Saturday. This week opens up regular play for the Lake Superior State Lakers, and it just so happens to be against in-state, in-U.P. rivals the Northern Michigan University Wildcats in a home-and-home non-conference set. Both teams are coming off of disappointing seasons and both have had some major changes in the locker room. But both teams have the same goals on their minds: First, win the Cappo Cup. Second, get into the NCAA tournament. The Wildcats made the WCHA playoffs as the 8th seed and took the eventual champions, Bemidji State, to three games. Just making the playoffs was an accomplishment for Northern Michigan, however, as very little went right for the ‘Cats in the first half of the season. As a result, NMU stood with a woeful 4-16-2 overall record at the start of 2017. It took the patented Walt Kyle second half turnaround to get the Wildcats to even contend for a playoff spot. In addition, they tied Wisconsin(B1G) 2-2 in two non-conference series; and a nine game winning streak, sprinkled with a five game shutout streak for goalie Atte Tolvanen, which fell just short of former Lake State star goalie Blaine Lacher. Tolvanen went for 339:05 without a goal against, where Lacher went 375:01 in route to the 1994 NCAA championship. Lucky for NMU, Tolvanen will be coming back for what will be his junior season. Also returning is senior Robbie Payne, who had the second most points on the team behind the now graduated Dominik Shine. On the blueline, sophomore Philip Beaulieu and Jordan Klimek return. Northern will also be carrying seven freshman this year: one goalie, two defensemen and four forwards. They will have to step up and help lift this team up. The major news in the offseason was the firing of head coach Walt Kyle. There was some controversy surrounding Kyle’s departure that came out in the days that followed the announcement, but they hired former Minnesota assistant coach Grant Potulny, who helped the Gophers to a half-dozen regular season championships and nearly as many NCAA appearances. I think everyone who follows college hockey knows just how strong Minnesota has been, so this hiring should have Northern fans excited. If you just looked at the first month of the 2016-2017 season, you would have expected the Lakers to make it to the WCHA finals, or at least host a game on their home ice. The Lakers started the season 5-0 against NCAA opponents, outscoring the opposition 27-11 in that time, and 30-15 for the month of October. November started the same way, beating Minnesota State 5-1, but after this, the team was inconsistent but showed flashes of brilliance before being trounced by Michigan Tech in the WCHA quarterfinals, being outscored 14-4 in two games. The Lakers have had their fair share of changes in the offseason. Last year’s leading goal scorer, sophomore Mitch Hults, left the Lakers at the end of the season to join the San Diego Gulls of the American Hockey League. Likewise, standout blueliner Kristofers Bindulis joined the Hershey Bears of the AHL following the season finale. Luke Morgan transferred to Michigan after only one year with the Lakers after netting 22 points in 36 games. Goaltender Gordy Deifel used his last year of eligibility and is now with the Utah Grizzlies of the ECHL. Returning players include forwards J.T Henke, Diego Cuglietta and Anthony Nellis, who each had outstanding seasons and Collin Saccoman will be anchoring the blueline alongside the newly named captain Aiden Wright. Saccoman ended last season tied for fourth in blocked shots across the entire NCAA with 94 blocked shots, which is 2.61 blocks per games played. Once again the Lakers have their fair share of freshman, with eight freshmen and one sophomore transfer coming in. Included in these players are two goalies, Mareks Mitens and Roman Bengert, each have impressive resumes, having been named Goaltender of the Year in each of their leagues, and Mitens being named the NAHL MVP after a record –setting season. The blueline will have four new members battling each week for a spot, and they are some big guys, averaging a height of nearly 6’3. Three players join the forward corp, with Hampus Erikkson being the most noteable standing at 6’6”. Hailing from Sweden, Erikkson joined the Fairbanks Ice Dogs of the NAHL last season, Posting 17-38=55 points in 57 regular season outings. He had 2-6=8 in 7 playoff games. The Lakers hope that will transition to the NCAA level. With just these notable examples, this writer believes that the Lakers have shore up some of the deficiencies that many fans thought they would have after the losses from last season. The Cappo Cup was first awarded by the late Reverend Monsignor Louis Cappo, a pastor from Baltic, MI, but spent much of his life along the shores of Lake Superior. He was a member of the LSSU Board of Trustees, was given the Northern Michigan University President’s Award; These are what links the two schools, and what lead to him creating the Cappo Cup in 1991. The cup goes to whichever team takes either 1) the season series or in the event of a tie 2)outscores opponents during the season series. NMU holds the series record, by our count of 15-9. The puck drops Friday at 7:07 PM at the Taffy Abel Arena in Sault Sainte Marie, MI & Saturday at 7:00 PM at the Berry Events Center in Marquette, MI. Both games can be heard both locally and on the net at 99.5 YesFM. The Best College Hockey Tradition Around! 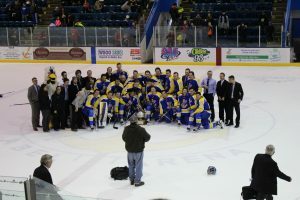 As any Laker fan could tell you, one of the best and most special traditions that the Lake Superior State University Laker Hockey Team holds is that of the ringing of the Victory Bell. After each home game win, the boys run out of the Norris Center, gear and all (sans skates) through a tunnel of cheering fans and out to the Frank and Gladys Hoholik Victory Bell (see history under the Abel Arena page). Led by the player voted by their team as MVP of the game, each player takes their turn tolling the infamous Victory Bell. It’s a tradition unique to Lake State and one which every fan should get the opportunity to experience during their lifetime. Rain, snow, sunshine or bitter cold, this tradition is a great way for the team to celebrate their win with the fans. Ever heard the term “Ringy Dingy” used around the rink? That term originated around this tradition as longtime equipment manager and Laker Hockey fan Gil Somes used the term to wish the boys luck as they took the ice every game, reminding them of the goal to win the game so they could ring the bell. A plaque commemorating Somes and his now famous phrase was placed on the northern end of the Laker’s bench following Somes’ death in 2015. See attached video for a unique daylight view of the ringing of the victory bell. SAULT STE. MARIE – The Lake Superior State Lakers kicked off the 2017-18 season on Sunday, October 1st with a matchup against Laurentian University at the Taffy Abel Arena. The Lakers, under head coach Damon Whitten, overcame a slow start to defeat the Voyageurs 3-2 on the strength of two third period goals. The Voyageurs got on the board first when defenseman Jayme Forslund put the puck past Laker netminder Nick Kossoff for a power play goal. The visitors from Sudbury controlled play throughout much of the first period, outshooting the Lakers 10-5 in that period. The Lakers tied things up later in the period when forward Jake Hand slipped the puck behind Voyageurs goaltender Joel Vienneau. Vienneau was the goaltender for Laurentian when the Lakers played them in an exhibition game to start the 2016-17 season, making 50 saves in that game. In the second period, Laurentian reclaimed the lead early, when Tyler Shaw intercepted a pass and streaked in on Kossoff. Shaw put the puck over the left pad of Kossoff to make the score 2-1. The Lakers gradually shook off their sluggish start, outshooting the Voyageurs 17-8 for the period. Despite the shot differential, Shaw’s goal was the only one of the second period. To start the third period, Laurentian pulled goaltender Vienneau in favor of Charlie Millen. The Lakers’ offensive pressure finally enabled them to cash in with a power play goal by Diego Cuglietta. Cuglietta collected a rebound off the stick of freshman forward Hampus Erikkson and scored on Millen’s right side to tie the game. Barely a minute later, forward Max Humitz knocked the puck over the left shoulder of Millen, putting the Lakers ahead for good. Humitz was one of the leading scorers for the Lakers last season, and was named to the Western Collegiate Hockey Association (WCHA) All Rookie team. Lake Superior outshot Laurentian 41-21 on the game, and dominated the shots in the third period, 19-3. Following the game, Whitten praised the play of many of his players, including Hand and defenseman Matt McArdle as well as his senior class. Kossoff finished regulation with 19 saves on 21 shots. Laurentian’s Vienneau had 23 saves on 24 shots and Millen chalked up 15 saves on 17 shots for a composite total of 38 saves on 41 shots. On special teams, Laurentian had one power play goal on four opportunities, while the Lakers cashed in on one power play goal on nine chances. Neither team allowed a shorthanded goal. Despite the Lakers winning the game in regulation, a five minute 3 on 3 overtime period was played to help Lake Superior get some practice in 3 on 3. Last season, the WCHA implemented a 3 on 3 overtime to be played if a game was tied after regulation and still tied following the NCAA-mandated five minute 5 on 5 overtime. In the overtime, junior forward Anthony Nellis slipped the puck through the five hole of goaltender Millen to end the session. Lake Superior officially opens the season on Friday, October 6th with a non-conference home-and-home series against Upper Peninsula rivals Northern Michigan. The Wildcats will have a new face calling shots behind the bench, as former Minnesota assistant coach Grant Potulny replaces longtime head coach Walt Kyle. The Friday game starts at 7:07 p.m. at the Taffy Abel Arena, while the Saturday matchup will take place at the Berry Events Center in Marquette, Michigan, also at 7:07 p.m.